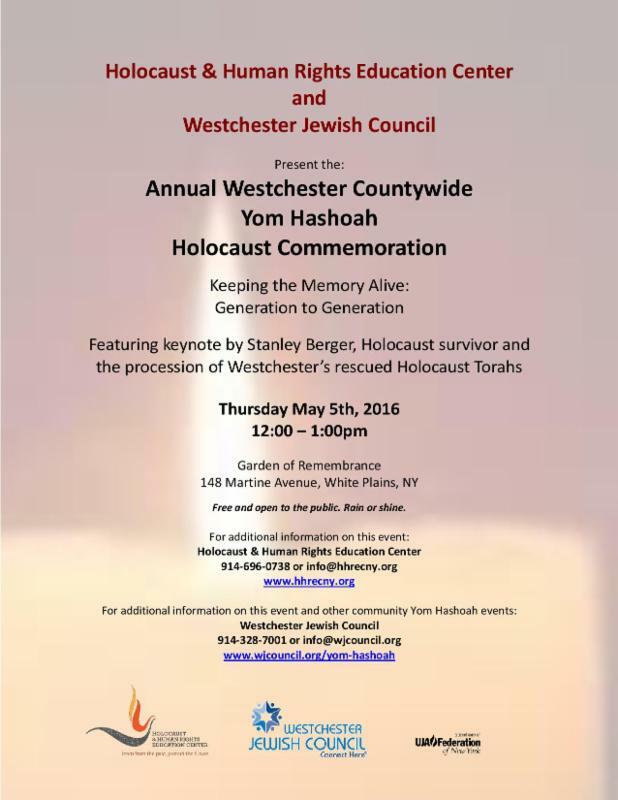 A few years ago Alan Hochberg, a former Greenburgh resident and former executive director of the Scarsdale SynagogueT emples Tremont and Emanuel interviewed some local holocaust survivors. He was assisted by Mona Fraitag, co-President of the Poet’s Corner Civic Association and by Monica Gordon of Hartsdale who is active in Holocaust Museums and whose father was a survivor. In addition, Judith & Lowell Pollock (who sadly passed away earlier this year) , former educators, were helpful in preparing these videos. George Malone and Janelle Wallace of the Greenburgh Public Access directed and edited the interviews. The interviews will be aired on our local public access TV stations on Wednesday beginning at 9:30 PM and will air continuously till Thursday night. The interviews will also be re-broadcast at different times during the weekend. Our public access channel-can only be seen in Greenburgh is: Channel 75 on Cablevision and 34 on Verizon FiOS). We must never forget! As we remember the six million Jewish victims of the Shoah, defamed, demonized and dehumanized, as prologue or justification for genocide, we have to understand that the mass murder of six million Jews and millions of non Jews is more than statistics –every person had a name. An identify. As others have so eloquently stated – every person is a universe. To our non Jewish neighbors—we must remind everyone that the world continues to show an indifference and inaction to the unthinkable---in recent years we have seen ethnic cleansings in the Balkans, genocide in Rwanda, horrors in Syria, in Africa and in Asia. Genocide continues…. You’ll find recent examples of genocide in Burma. The Central African Republic. Against the Somali people in Kenya. Other places around the world. This is unspeakable. Because genocide is and was preventable. The world has ignored the lessons of history. Edmund Burke once said the “surest way to ensure that evil will triumph in the world is for enough good people to do nothing.” Indifference and inaction means that we are coming down on the side of the victimer, not on the side of the victim. If you are a holocaust survivor and would like to be interviewed or if you are a child of a survivor and would be interested in having your parents story highlighted on local access TV please e mail me at pfeiner@greenburghny.com. We will arrange an interview that will be aired in the future and included in our archives. 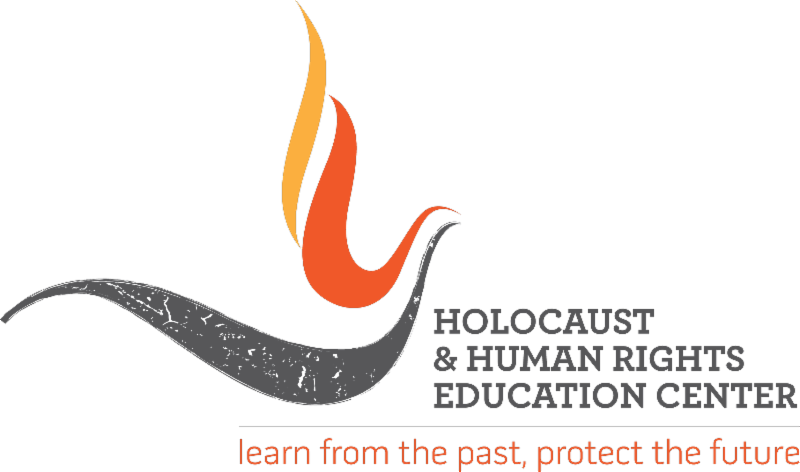 Since 1994, the Holocaust & Human Rights Education Center has brought the lessons of the Holocaust, genocide and human rights crimes to more than 1,750 teachers, and through them, to thousands of middle and high school students. The Speakers' Bureau reaches over 20,000 students each year. The Center's mission is to enhance the teaching and learning of the lessons of the Holocaust and the right of all people to be treated with dignity and respect. The Center helps schools fulfill the New York State mandate that the Holocaust and other human rights abuses be included in their curriculum.